Easily Explore Boston our Hotel's Perfect Location. 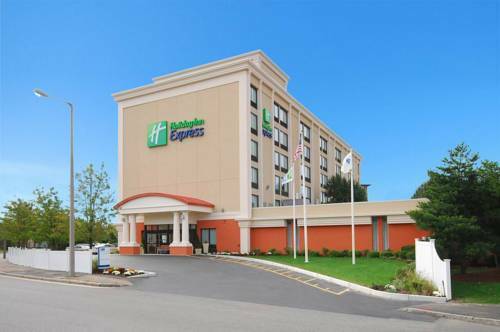 The non-smoking Holiday Inn Express Hotel Boston, located just five miles from Logan International Airport (BOS), offers guests affordable accommodations minutes from the action of downtown Boston. The hotel's patrons appreciate our excellent amenities and the utmost in customer service. Since the Holiday Inn Express Boston is located only three miles heart of Boston, MA, corporate travelers find it easy to attend events at venues like Haynes Convention Center, less than two miles away. Guests are within minutes of the University of Massachusetts, Tufts University and Boston Medical Center, as well. It's a breeze to host meetings on-site with two event rooms that can seat up to 100 people. Other on-site perks include free Wi-Fi access and a Business Center. If you're vacationing in the area, remember that the hotel's site near Fenway Park provides convenient access to Red Sox games. Patrons also enjoy exploring the historic downtown area, home to the Freedom Trail and Old Town Trolley Tours, and you don't want to miss a tour of the USS Constitution. The New England Aquarium is a family favorite. Guests enjoy all the comforts of home at this hotel. Amenities like a 24-hour shuttle ($5/ride) to and from Logan Airport also come in handy, Stay Smart" with us the next time you're in Boston. Quaint eatery surrounded by trees and plants presents New American cuisine in a red hued dining room. Lively, family friendly chain featuring Italian standards such as pastas and salads, with a full bar. Full service chain bar and grill providing hearty American eats in an informal setting. Counter serve bakery and cafe chain serving sandwiches, salads and more, known for its bread and free WiFi. Conveniently located off the lobby yet quiet enough to host even the most sophisticated meeting. There's ample natural light with black out drapes that can be drawn if a presentation requires such. Excellent local catering to suit all palets.